A biennial 2-day/3-night residential course at Merton College, Oxford, by special invitation for Dark Angels who have already completed the Advanced Course. Join us in the city of dreaming spires as we continue to bring closer the worlds of creative imagination and business communication. Dark Angels courses are journeys into the unknown. With the Masterclass we stretch and stimulate, opening writers up to new possibilities and taking their work to new levels. Seminars include discussion of previously prepared work; a few angelic exercises; and a creative project that involves the city of Oxford itself. Three tutors participate as team members. On Thursday evenings we invite a guest writer with an Oxford literary association to dine and read to us. Previous guests include novelists Philip Pullman and Justin Cartwright. With Dark Angels, we're always after an element of magic, of transformation. 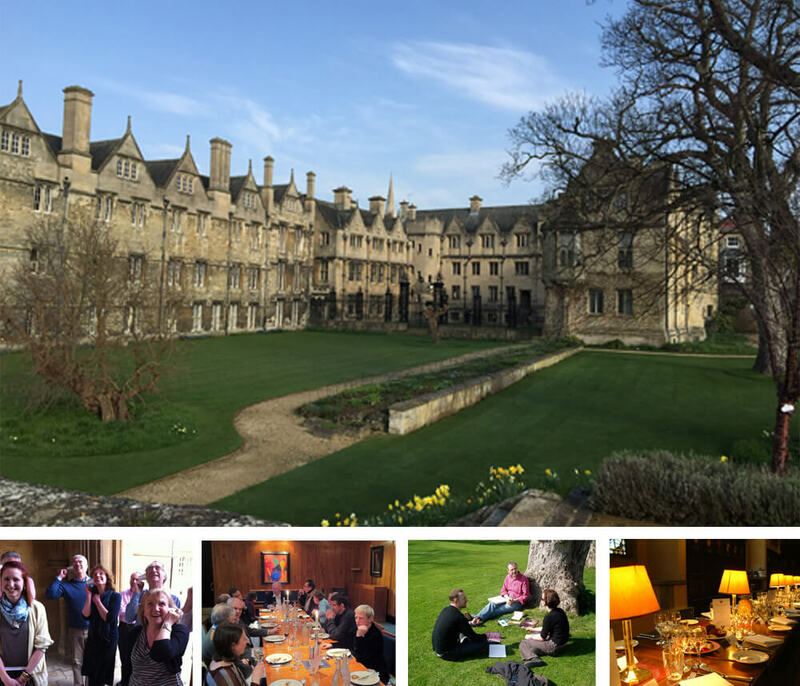 Existing students have experienced something of this from previous encounters, but we believe the combination of Oxford and Merton College raises the bar further on our already hugely successful Advanced Course.
" ... there is still that burning I feel since leaving Oxford. Thank you Everyone so much for advice, inspiration and above all that lovely companionship you only get from a bunch of Dark Angels fired up by their passion for words!" Perhaps the most spectacular of all Dark Angels venues, and certainly the most historic, Merton vies with Balliol and University College for the title of Oxford’s oldest college. Its foundation can be traced back to the 1260s when Walter de Merton, chancellor to Henry III and later to Edward I, first drew up statutes for an independent academic community and established endowments to support it. Mob Quad, one of Merton's quadrangles, was constructed in the years from 1288-1378 and is claimed to be the oldest quadrangle in Oxford, while Merton College Library, located in Mob Quad and dating from 1373, is the oldest continuously functioning library for university academics and students in the world. Notable alumni and academics past and present include four Nobel Laureates, one of them the poet TS Eliot, and the writer JRR Tolkien who was Merton Professor of English Language and Literature from 1945 to 1959. Staying in this ancient place of study, with eight centuries of learning seeping from the stonework, brings a whole new dimension to the experience of attending a Dark Angels course. We are housed in undergraduate rooms and eat breakfast, lunch and dinner at polished refectory tables in the paneled hall, hung with portraits of past and present Wardens. Our group sessions take place in one of the college’s tutorial rooms. We are free to wander through the cloisters and quadrangles, and enjoy Merton’s spacious private lawns. On the evening of our guest speaker’s visit we take sherry in the Queen’s Room, used by Queen Henrietta, wife of Charles I, and on the final evening we have a tour of the college and its unique library. 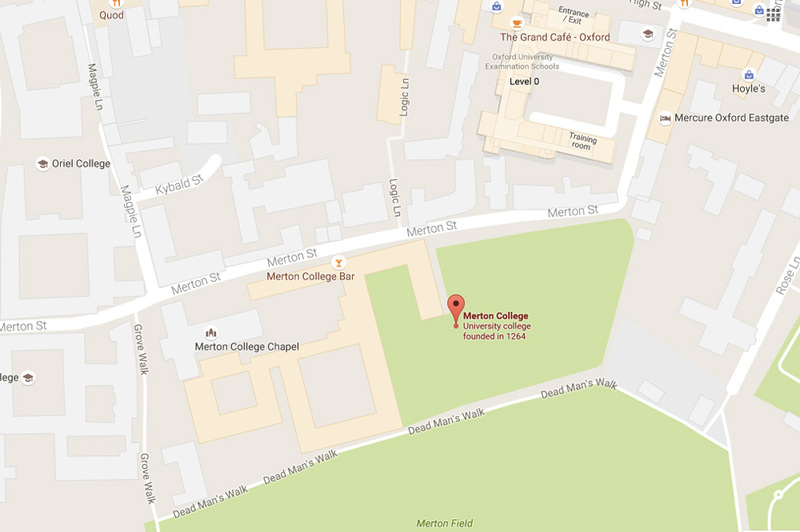 Merton College is in the centre of Oxford and parking is almost impossible. We recommend that you travel by public transport. The college is a 15-minute walk from the railway station.